It’s been a while since I did a comic post: I’m on a bit of a hiatus with them. Still, when I heard that they were coming out with a digital comic for the Vampire Diaries I was curious, and for $0.99 it’s a low risk investment. The distribution method and price point. At $0.99 even those who otherwise might not read comics should be willing to give this a shot. Digital distribution means no trying to locate a physical comic book store (which not everyone has access to) or having to pay more for the shipping than the comic itself. This is going to be a niche title, much like the True Blood comic and the cheaper costs associated with an all digital method should mean a lower price point to remain viable. There is some good banter between Damon and the new character, Julian. It attempts to explain why vervain, which is a weed, is so difficult to find in Mystic Falls. It does remember canon that says that a witch cannot become a vampire and remain a witch. The art work is iffy. Much like True Blood, the creatures try to ape the look of the actors who play the characters. Problem is, it doesn’t always translate well. Had the first bubble not specifically referred to Damon and Stefan I’m not convinced I’d have recognized them. Some panels are better than others. Along those lines, it’s said that vervain is needed for the witches’ magic. Since when? We never really see Bonnie use it. As far as I can tell, the ones who have used vervain the most are the vampires themselves. For that matter, early canon established that the Salvatore brothers controlled the vervain in Mystic Falls. If this spell wiped it out, then where did they get a supply to stock up their supply? And, if what Damon said is true about going to the Lowe’s in the next town over, why even bother to have that green house worth of vervain in the first place? I’m not even sure that the witches magic would allow this. The TVD form of magic is very nature based and it’s been well established that the spirits don’t like that which goes against nature (hence Esther being punished so horribly for what she did). I’m not sure that the spirits would allow this kind of spell to happen. I am curious as to where they are taking this, and for the price I’ll play along, but if the comic goes beyond the initial 3 issue run, the writers need to take (or retake) a crash course in the show’s mythology. Those who are apt to read the comic are going to be the ones who know what’s what and whose who and they aren’t going to necessarily hang on for the ride if it ultimately doesn’t make any sense. This comic does however, make me appreciate that Michael McMillian wrote the True Blood comic. Because he was both a fan and someone who worked on the show, the two canons flowed well together, so much so that the show later adopted some of his canon into the show’s. This title, however doesn’t have that luxury. The writer Colleen Doran may be an comic veteran, but I doubt she’s even seen an episode. I’m guessing that she was given a bullet list of Things to Know and is working off of that. It’s the only explanation I have for this otherwise odd plot choice. I’m going to hold off on a rating for now, at least get through this arc before I make a judgement to see if continuity issues improve, but right now, I’m not sure I can recommend it. I wanted to like this book. The Fae aren’t a species I normally read about: if/when I do go preternatural, I’m more of a vampire kind of gal. The more mature tone of the book sounded promising and I liked meeting Cathy – an intelligent girl who ran away from the Nether to live the life she wanted to lead and the introduction of Lord Poppy had me hooked. The author made the mistake of setting the main plot in a parallel world…and then forgot to fill that world with likable characters. The people we meet in the Nether are the worst kind of European aristocratic stereotypes that I’ve seen in a while. Beauty is so prized above anything else that the women in this society are taken into the Nether once they hit the age of majority and then pretty much never leave because aging of any kind is frowned upon. Her sister, though vapid, is seen as a much bigger prize because she’s so much more beautiful and musically talented. Her father is physically abusive (because she is a disappointment it is inferred). Her mother emotionally abusive and complicit in the father’s abuse, never stepping in save once so that Cathy wouldn’t have visible bruises. Her aunt takes her out to lunch so she can be kidnapped and coerced into finding her missing uncle. Her fiancee muses about sending Cathy to the countryside once he’s done his duty and had a few kids, turning over a new leaf mostly after verifying to himself that her purity is still intact. He does want to get her out of her abusive home, but mainly because he thinks she’ll grow more confident out of her father’s grasp (and not, you know, because it’s good to get someone away from an abusive partner/parent). I honestly can’t think of a single character in this lot I wanted to cheer for. As such, I didn’t care at ALL about the plot and the scheming because these people deserved it. So. Um. Yeah. I had Problems. I did hang on to the end of my version in the hopes of improvement, but alas. I do wonder if I really had a full book because it seemed to cut off in a funny place, but by that point the book had so totally lost me that it didn’t want me to investigate. We’re now a week past Allegiant’s release and more and more people have finished, so I think it’s time to look at why this book is getting such a negative reaction. I’m going to look at things through the prism of the ending, because I think everything ties back to that ending. Spoilers are abundant go away if you haven’t read it yet. As I said in my original review, from a plot point of view, Tris’ death was necessary. The second the rebels gathered in that lab to decide who was going to go into the lab and Caleb volunteered, I knew it was a red herring. Tris is not hardened in the way that someone even like Katniss had become by the end of Mocking Jay. To let Tris not go would have been a betrayal of the character. So why not let Tris have resistance and live? In my opinion, that too was a red herring. It was a way to give readers false hope that Tris might yet survive. The kind of set up we have was a classic heroic sacrifice. One must selfishly give up their life to save the lives of countless others. Tris has always been shown to hang on to her Abnegation morality and this move was the ultimate expression of that. The move was brave on the part of Roth. Rarely in fiction does an author kill off a protagonist, rarer still in young adult novels. The problem I have with Tris’ death isn’t that she died, it’s the set-up that lead to the death for two reasons. One: the science in this book is god-awful. Murder genes do not exist. Violence genes do not exist. Even if they did they are not the end all, be all reason that a person does something. You cannot “fix” a society by fixing a gene. You need to fix the underlying issues. You want less violence? Take guns out of the hands of the masses. Ensure the masses are well fed and have equal access to education and jobs and the chance for a secure life because it is inequality and desperation that leads to the kinds of acts that government is trying to stamp out. Patting someone on the head and being all “it’s all right, you couldn’t help yourself” is condescending and stupid. Think of it this way: a four year old starts to hit his playmates because they took a toy that he wanted to play with. The adult in the room doesn’t just giggle and say “oh how cute.” They take the child aside, tell that it’s wrong AND why it’s wrong and you correct the behavior. By having these people believe that the legit can’t help themselves they come across as bad parents and not legitimate scientists thereby undermining credibility in the plot. Oh: and making Four not actually Divergent? Total stunt writing to give his character motivation to join the rebels. From Chicago’s point of view he is so why is he letting a stranger change his view of himself? Anyway. For that matter, why should we believe the rebels and what they tell Tris? We’re supposed to believe them and their story and the slide show they provide is supposed to be proof because we can recognize ourselves in it. But why should we believe them? Better still, why are Tris and Four believing them? They JUST got out of a society where everything was carefully manipulated to keep them in their place. Shouldn’t they be a wee bit more suspicious of what anyone is telling them? I know they’re in Dauntless and not Erudite, but c’mon! Neither Tris nor Four are stupid but this is making it seem that way. And this is the heart of the problem: there is no buy in here. If I don’t believe in the story being fed to me, then I’m not going to believe that her sacrifice was necessary and instead I’m going to go from raging for the first 60% of this book to being drained and kind of depressed the last 40% when I see where it is going. Maybe Roth did have this planned out from the beginning, or maybe it’s as I felt and that she only knew that she wanted Tris to die. Whatever happened, I feel like this series should have been a duology. An ambiguous ending over the fate of Chicago would have been ultimately more satisfying than what we were given and judging from the reviews that are lukewarm at best, I don’t think I’m alone in this belief. Sounds awesome, right? Catherine the Great was one of the early modern period’s greatest monarchs, regardless of gender. Here’s a woman that you know has to be both intelligent and cunning in order to reign as long as she did and to be as prosperous as she was. She should be the source of tons of rich material for a novelist to play with and yet tragically the author focuses so much on the personal to the expense of everything else. I started to get this nagging feeling about 40% in that something was off. 50% in I started wondering why I was still reading. 60% of the way in I realized that I had barely learned a thing about her except that she could be too forgiving (a phrase repeated time and time again). I learned more about the personality of her lovers and of 18th century medicine (bloodletting is bad kids) than I did of her. And for a novel that is meant to be a retrospective look at her life, that’s not a good thing. If I had to pinpoint the one major thing that might have lead the book astray, it would have to be the structure of the book. It is simultaneously one of the best and worst things about it. On the one hand, it’s beautifully written. The conceit – Catherine has had a soon-to-be fatal stroke at 77 and spends the last day of her life reflecting over her life – works well. There’s this beautiful kind of hazy feel to the book. The book isn’t really linear in the traditional sense. One paragraph she’s a few months married, the next it’s seven years later. It makes sense, a dying person isn’t going to go over every moment of her life. On the other hand, I think this is where the problem lies. One minute her then Favorite Count Orlov is talking about possibly staging a coup. The next paragraph the coup is done. Finished. Successful and she’s donning a military uniform to greet her subjects. That’s fine for her sake because she obviously knows what happened in the intervening period. Unless the reader is a historian though, they probably don’t. By writing the book in this way we almost never get to see Catherine be Catherine. We never really see her tangle with her foes inside or out of the court. We never see her cultivate her spies or even really lovers beyond who introduced them. We never get a sense of what made Catherine so Great, not the way that we were promised and even teased. The beginning of the book has this great section where we see then-Sophie come up with a way to get out from under the thumb of her mother (whom she can see is going to ruin her prospects at Court if she doesn’t do something) and ingratiate herself more to Empress Elizabeth. I loved it and I wanted more of that and I think that at least some those picking up this book would want more of that too because even today she’s more discussed for her notorious love life (which by modern standards doesn’t seem that scandalous at all) than her accomplishments. Instead the focus is squarely on her lovers and she’s deserving of better than that. It’s ironic, isn’t it? Catherine complains of the slander of her love life on multiple occasions throughout the novel so what does the author choose to focus on? Her love life. At the end of it all, it felt like an opportunity missed. 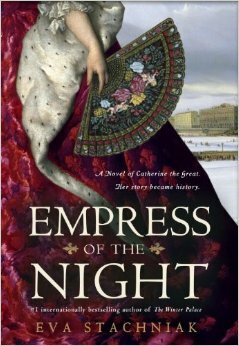 The author took great pains to paint Catherine as a woman of strong will, but by focusing in so closely on what realistically is one of probably the least interesting aspects of her life, I lost my will to finish this book before she lost her will to live. 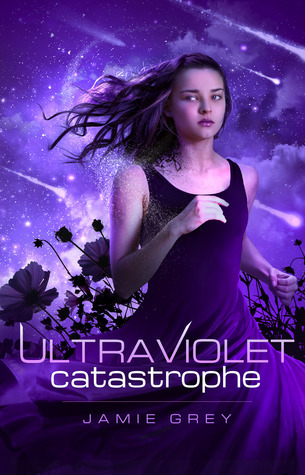 I’m (temporarily) burning out on young adult fiction, I could say it’s just against the dystopian sub-genre, but frankly these are issues that often turn up in fantasy and other YA sub-genres as well. Most of my grievances against this book are problems I have with the as a whole: the cliché of it all being a government plot; the grossly over-simplified science with the tinge of Eugenics that drives the entire plot along (murder gene, really?) the enforced notion of a black and white morality even when hints of a story that wants to be more nuanced peek through and finally an ending that while definitely brave on the part of the author (I will give her a standing ovation for having the balls to do what she did; the story called for it and anything else would have been a cop out) still manages to slide into optimism for the future. Can’t we have ONE novel where things might not actually improve? The one complaint I will keep from that first draft is over point-of-view switching. The author stated she did so because she needed to do so to tell the story she wanted to tell. When an author changes the way she did it tells me that they couldn’t make their story work and you can’t convince me otherwise. I don’t think we gained much from the story being told the way that it was: first person is by definition a limited view point. If she wanted to give us insight into Four, either keep it in the short stories or she should have written the books in 3rd person omniscient instead. I see the change as necessary later on, but she could have pulled a J.K. Rowling and changed when absolutely necessary instead. It would have been more impactful. As it was, the two voices were so similar and they were interacting with most of the same people so it wasn’t always easy to keep things straight. So after all that…can I recommend the book? Personally, I’d be lying if I said this was anything other than a Skip It. But, in the interest of fairness I do recognize that I might be more biased than normal due to my burnout. So instead, I will give it a conditional Borrow It. Those reading the book for FourTris will probably enjoy it. If you were reading it for the world building or if you get annoyed by same kind of things I do, then you may or may not. The series as a whole I will leave as a Borrow It and take on a book by book basis. Ultimately, like Hunger Games, I think the first book was the strongest. On the whole, I think that (despite my issues with that series) that it’s also the stronger series so newbies to the dystopian subgenre should start there first. Readers looking for more interesting fare should probably look for adult titles. I seem to be on a roll with this whole ‘kids in schools that aren’t really schools’ genre aren’t I? There was the KGB run “school” in Sekret, the school QT Technologies which was more like a research facility in Ultraviolet Catastrophe and now we have St. Brigid’s, a school where the action takes place, but is rarely used in the school context for purposes of the story. Becca is a 17 year-old girl who has always watched over her brother Ryland. She’s known for years that there was something different about him, and has spent her young life trying to protect him from those that would institutionalize him. Then one day a pair of men named Alex and Taron ask to him him to St. Brigid, a place where there are other people like her brother so that he’ll fit in. Though he is the driving force behind the story, he is quickly relegated to the sidelines as he fits in almost instantly, shifting the focus to Becca herself. There is a twist about half-way through the book that, while not necessarily telegraphed, it’s pretty easy to figure out, both from the hints that are dropped and just that the book does feel kind of predictable. This is one of those books that doesn’t really do anything new and doesn’t necessarily try to. 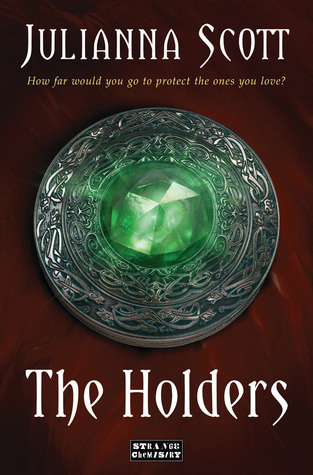 Though called “The Holders” the abilities we see here aren’t necessarily all that outlandish (no flying here) and many of them would fit in on shows like Heroes or the Tomorrow People. 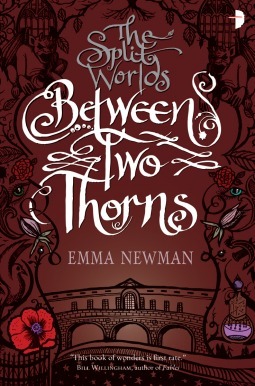 It’s also one of those books where ultimately, beyond the big twist and the resolution of the story that was set up, not that much really happens, choosing to save the real action for the sequel, instead focusing more on Becca and her personal life, which again, holds little real surprises and probably end up the way you expect it to. At the end of it, this is going to be one of those books that you’ll forget about a few days after you’ve read it. It is a fun and quick read and if you’re looking for some light escapist reading, this will satisfy. When I first read the blurb for this book, I was hooked: a girl discovers that she’s a genius and goes to a school filled with like minded people. Once there she discovers that not all is as it seems and it takes the brain power of her and her classmates to try and find a way to save the day. I love the premise of this book. It’s so painfully rare to find books that a) feature girls interested in STEM, let alone as protagonists and b) lets the characters be smart and uses that intelligence as a central plot point. It’s a refreshing find and a book that I think you could give to girls and be like, see? It’s cool to be in this stuff. Lexie isn’t looked down upon for being smart (if anything, upon arrival she’s looked down on either for being a perceived threat and/or possibly not being smart enough) or her abilities – she’s lauded for them. That the author found a way to take some real world physic theories and weave them into a compelling plot that’s almost like James Bond for geeks is just awesome. Another thing that I like is that Lexie feels real: she has Issues (abandonment, self-esteem) that she earned. They’re believable and she deals with them in believable ways – she’s quick to judge her absentee father and quick to get defensive when she thinks someone is doubting her intelligence. She lashes out, as quickly as a teen can too. She gets a crush on a classmate named Asher, and yet has heard enough gossip about him to make her weary to jump in. Even so, she is loyal to her family and develops loyalty to her friends and I do think that she makes a good role model. All that said, I do have some nitpicks. The lesser one has to deal with the way the author uses pop culture references. For one thing, they’re jarring. The first one that I remember seeing came in 40% of the way through the book. If you’re going to use them, they should be consistent. Also, at best these references will date the book. While there might be a year or two left in a description of a “why-so-serious” smile, I’m not convinced that the intended age group will actually know who Veronica Mars is. At worst, and I hate to say this…it comes off as lazy writing and almost feels like fan-fiction, especially when she repeatedly describes Lexie’s hair as being “Hermione-like.” It doesn’t even always work either. While I know that the author means book Hermione, the Hermione in the movies doesn’t really have that hair outside of like the first film and so the readers of this book may not even get what she was going for. Just describing it as “bushy” or “unmanageable” would probably have worked better. The biggest problem I have though, comes with the conceit of the book. As the summary explains, Lexie was drugged to keep her at “average” intelligence. As the drugs stopped working, she suddenly found herself a genius. This is all well and good; except that apparently along with a genius intelligence comes the ability to just “know” things. Lexie talks about answers popping into her head, or wondering how to do something and than suddenly just knowing how to do it. Not even looking it up once and getting it, it just there, like someone just fed the information into her brain. It’s a conceit needed for the book, because although her classmates are all high-school aged, they’re working on “graduate” level physics problems and if she doesn’t suddenly get all this there is no way that she could ever go to this school and the plot of this book wouldn’t exist. The story is good enough that it’s worth suspending disbelief, but at the same point in time I believe that the best stories can set up their world so that you don’t need to. On the whole, I do think the author has written something unique and should be commended. If you’re into smart books, go give this a shot. As I type this, it’s a steal at $3.99 for the Kindle edition. It doesn’t take a genius to see that this is a steal.